—a widely circulated and often reproduced image of Guy Fawkes sneaking toward the House of Lords, matches and lantern in hand. (Click on any of the images in this post to enlarge them in Luna.) It’s easy to read Partridge’s bumbling analogy as a comedic misinterpretation of the seriousness of the Gunpowder Plot—after all, he seems to see no difference between a flame intended to ignite barrels of gunpowder and one used to light candles in a playhouse (!). There’s a second level to his comedy, though, lost to most modern readers: namely, that by the eighteenth century this iconic depiction of Fawkes simply was as common as lit chandeliers. 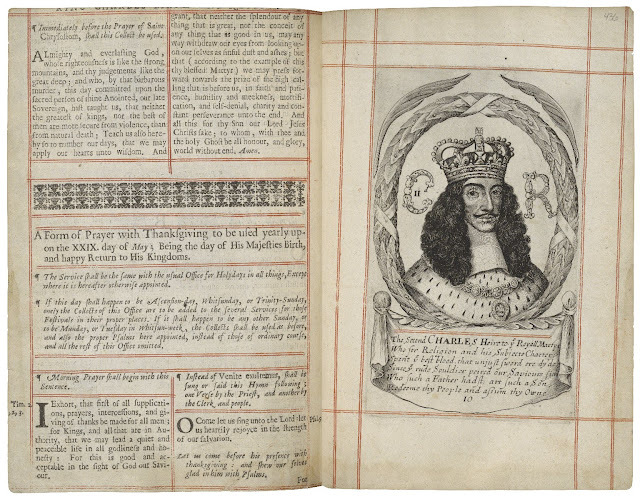 Found interleaved in many (if not most) extant post-1662 copies of the Book of Common Prayer, this image, along with another showing Charles I’s execution and a third celebrating Charles II’s return, iconically punctuated the state services added to the end of the restored Prayer Book. While the Folger holds many fine examples of extra-illustrated Prayer Books, I’ve been researching a copy that makes particularly interesting use of the practice of interleaving liturgical texts with images. 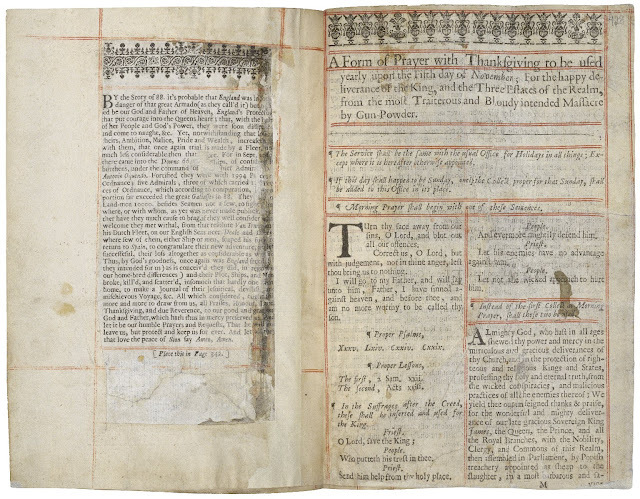 Like many others compiled in the seventeenth century, this Prayer Book is bound within a collected volume that includes several religious texts, including a Bible, a copy of Sternhold and Hopkins’ Psalms, an Apocrypha, John Speed’s genealogical tables, and John Downame’s concordance. Unlike other composite volumes, however, this book—really, an aggregate of multiple printed books bound together—is heavily interleaved with loose prints, diagrams, maps, illustrations extracted from other texts, contemporaneous portraits of religious and political figures, even an elaborate (and as-yet unidentified) manuscript monogram. 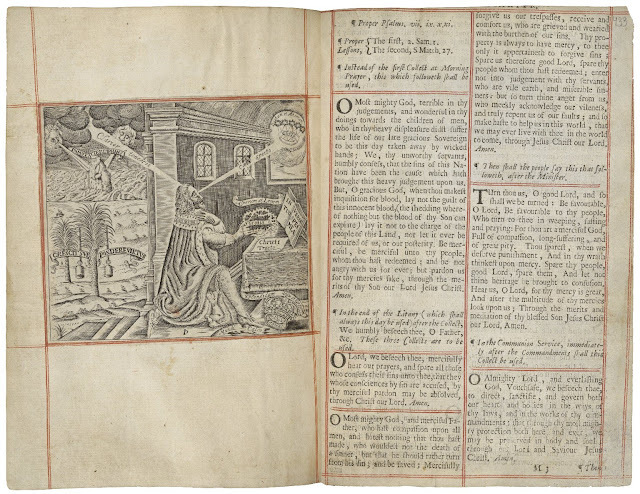 In fact, most of the leaves of the Bible in this copy have been removed and replaced with images culled from different sources, including William Slatyer’s illustrations of Genesis (a set of 40 plates published in the 1660s) and an unidentified German book, possibly some form of illustrated Bible that includes scriptural passages in both German and Latin. In short, the owner(s) of this volume went far beyond the standard practice of interleaving one’s Prayer Book with a few ready-made prints of Guy Fawkes! Pasted on the verso is a thanksgiving prayer describing England’s second deliverance from the Spanish Armada. 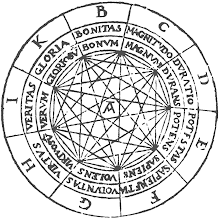 (I haven’t yet attempted to source this, though text and image seem to be from the same book; if you know what it is, please leave a message in the comments!) Appropriately enough, this entire sequence comes at the end of the section on prayers to be used at sea. 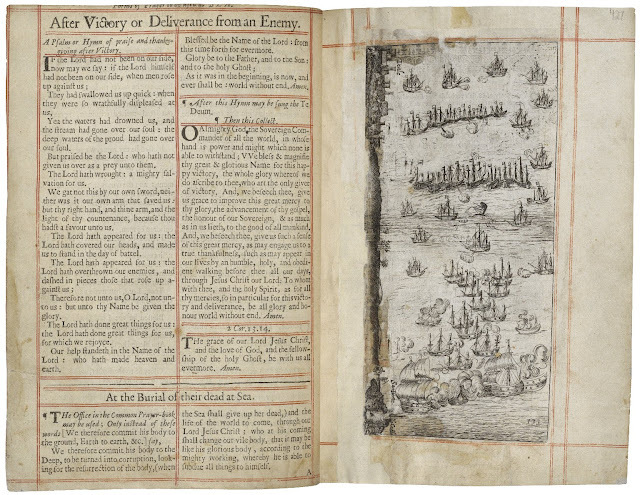 The inclusion here is unusual; perhaps the family that composed the book was involved in the Battle at Downs or was particularly invested in naval politics, a hypothesis supported by the inclusion of interleaved maps elsewhere in the book.The Prayer Book continues with a thanksgiving for deliverance from the Gunpowder Plot of 1605, illustrated with the typical engraving mentioned above, followed by the prayer to be said on the day of Charles I’s martyrdom. 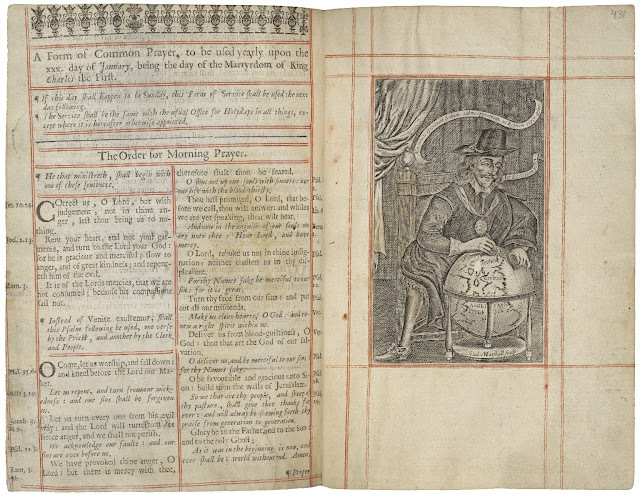 Rather than using the standard martyr illustration, however, the owners have interleaved an image of Charles I seated in front of a globe, a pen poised in his hand over Scotland. —followed finally by the more standard engraving of Charles I’s execution, captioned with scripture. The entire sequence ends with the prayer commemorating the Restoration, accompanied by a regal portrait of a crowned King Charles II. 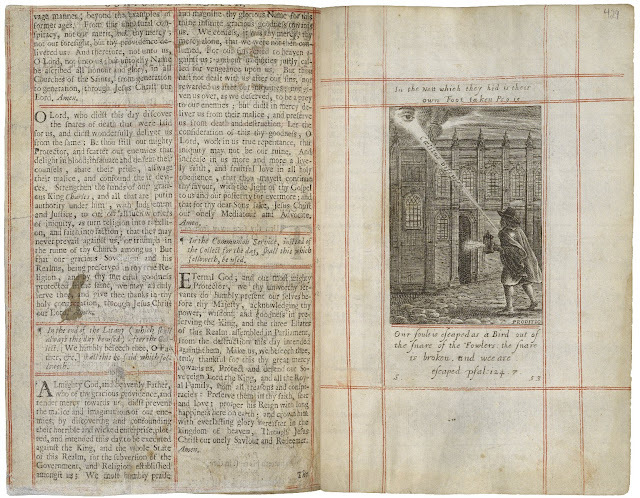 Far from simply inserting the usual imagery, the book’s owner(s) creatively use a variety of illustrations to narrate the collection of state services at the end of the Prayer Book as the story of Charles I’s martyrdom. Thus the Battle of the Downs—at the time, considered a political embarrassment for Charles—becomes a victorious “deliverance” equivalent with Elizabeth’s 1588 defeat of the Armada, while his execution becomes merely the full stop on a royal life that was always already martyred to the English church. 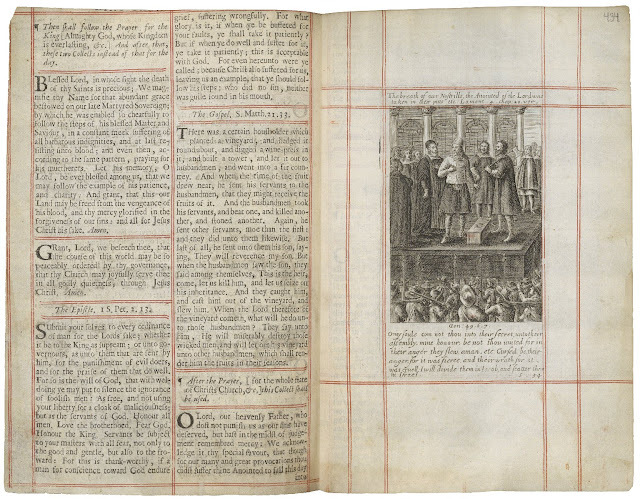 Since some of the printed editions included in this composite book seem to predate Charles I’s execution, the positioning of images within the text, as well as the book’s remixing of pre- and post-execution materials, serves to renarrate and thereby restore Stuart religious politics. I first came to this fascinating book through my research on the Little Gidding Harmonies, a set of cut-and-paste biblical concordances produced in the 1630s and 1640s at the religious community of Little Gidding. While I don’t have space to get into the connections between these books, it’s worth noting that both the Harmonies and the Folger’s volume share an interest in absorbing other printed materials—books, pamphlets, engravings—into their physical framework. The owner(s) of the Folger volume were careful to make their collection appear to be a unified single volume, going so far as to extend the margins of the Psalter and the German illustrations with pasted strips of paper in order to match the page width of the rest of the book. Prints that aren’t large enough to be interleaved are carefully cut out and pasted onto fresh paper, and each page is visually framed with red ink lines. Like the Little Gidding Harmonies, this book is invested in disguising its multiple origins, even as it trades on the excess signifying power of, for instance, the Marshall engravings it recycles. If (returning to Tom Jones) Partridge’s offhand remark satirizes how common images of the Gunpowder Plot had become, then the volume at the Folger indicates how uncommonly such images could be used. Through a highly material process of cut-and-paste composition, the owners of this book transformed a set of mass-reproduced religious texts into a wholly new document that uniquely reflects—or perhaps carefully projects—their political and religious affiliations.